Designed by award-winning architect and landscape designer Bill Bensley, who was recently included in Architectural Digest’s AD100 list, each villa is unique in design and layout, yet all boast only the most luxurious of materials | tropical hardwood, teak and terrazzo interiors, customized bathtubs and ensuite rainshowers | custom-designed décor providing the perfect finishing touches. The Estates Samui has twice been recognized by the Thailand Property Awards for Best Villa Development (Samui), and in 2010 received the award for Best Interior Design. 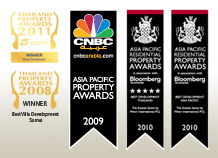 The Estates Samui has also received regionwide recognition, winning the Asia Pacific Property Awards 2010 for Best Development in Thailand and Best Development overall in the region.